This is a sermon I preached this past Sunday in my local Church of the Nazarene setting. My tradition has a precarious and intimate relationship to this text, especially as it concerns ideas of the holy spirit, holiness and Christian experience. As I began to look more carefully exegetically at this passage, particularly within its Luke-Acts literary corpus, I began to see and pick up on some motifs that I believe my tradition and many evangelical traditions are sadly overlooking…and that is: the Pentecostal descending of the Holy Spirit on the early Church is not a prescriptive event that serves to edify the walk of an individual believer. Pentecost occurs, rather, in order that those witnesses that heretofore were unable to witness to the Resurrection of Jesus might now be able to do so. Pentecost is not a “movement” or a “stage” that Christians traverse as they become more “holy,”…Instead it seems that Luke-Acts insists this happens so that those already sanctified in their following of Christ might now be able to proclaim the nonsense of a dead carpenter…who is now not so dead…is the Messiah of God. Further, not only does Luke-Acts make this argument, it further goes on to nuance how this events is interpreted as a “last days” event within the prophetic text of Joel and therein reinterprets how we today MUST also rethink our idea of “last days,’…but you’re gonna have to read the sermon if you want to see how this works out. As an aside, the first several paragraphs are a rehearsal of the Christian calendar as we have only recently started being very intentional about the Christian seasons in my ministry context. I felt that since Pentecost is the climax of Easter celebration and beginning of ordinary time, or what I like to call life as usual, that this rehearsal was in order to help the congregation re-member where we have been. Should you not need the reminder of the seasons please move to the paragraph that begins discussing Pentecost. So…with this said, I hope this sermon on Pentecost is helpful as you continue in your pursuits to narrate your life around this resurrected one we call Jesus the Christ. We have been busy following the journey of Christ this year, following the calendar that marks events in the life of Jesus and dares us to participate in those events. It has been a journey that is now about to both end, and begin. This day is marked by colors of red, faint sounds of whirlwinds and descriptions of fiery tongues that descend upon those who are witnesses to the resurrection of Jesus. The journey of Jesus the Christ has brought us to this peculiarly strange place this Sunday known as Pentecost. It has taken us a while to get here. We started in that season of Great expectation, a season of awaiting the coming Messiah and his birth. It was a season in which we anticipated not only the birth of Christ, but also the return of the living Christ again with great heavenly choruses’ to announce his entrance on the white horse, just as they announced his birth in Bethlehem. It was the season of Advent. From advent, we moved to Christmas…a 12 day period that began with Christmas day. This is a 2 week long season in which we concentrate on the arrival of the Christ. This season is then closely followed by what we call Epiphany. The Season of Epiphany is that time when we cease simply knowing that Christ has been born amongst us, and we actually realize who he is and we trek to see him, offering gifts of adoration and praise just as the Wise-men demonstrate to us what it looks like to be those who have had the ultimate “aha” moment. After these seasons of expectation, rejoicing and realization…we enter into a place that begins on Ash Wednesday…we journeyed with Christ into the desert during a time we call Lent. During lent we wandered the desert with Christ, we faced our own mortality, we became aware of the ministry of Jesus that at times perhaps made him long for those lonely desert moments in Luke 4 over the trials and obstinacy of people who did not believe his message. When Jesus left the desert he went and preached his first sermon in his hometown…and if you will remember, it was not warmly received. We have followed Christ through those Lenten places that led him to that most precarious of all weeks in his life…the Week we now call Holy week. We followed Jesus down the Hill of Mt Olives from the Garden of Gethsemane and ushered him into the city of Jerusalem in order to celebrate the Passover feast. We went with him to the temple, we heard him exchange with beggars, we were there when he broke bread and gave us wine…and our hearts were broken and confused when Jesus was arrested, tried and crucified during this week. The events that we now call Palm Sunday, Maundy Thursday and Good Friday were events we wished hadn’t occurred, yet we find ourselves on this journey with Christ so we walk where he walks, even if we learn things about ourselves along the journey that we don’t particularly like. But then, the journey takes us unexpectedly to a place known as Easter…Easter morning we arise still grieving the death of Jesus only to be awakened by women screaming at the top of their lungs that Jesus’ tomb is empty, that Christ is not there, that something strange has happened. We stand shocked, worried, strangely happy…as we then entered Eastertide. Eastertide was a 49 day period in which we focused on the reality of the Risen Christ, what that risenness is, what it looks likes, what it means…and we were there with Jesus when he appeared to us in the Gospel of John, when he made us breakfast on the seashore, when he appeared to the 500 and when he came and walked amongst us as we were leaving Jerusalem talking amongst ourselves about the strange things that have overtaken the city…the event of Easter has changed everything…but the journey is not over just yet. But this is something we should have been expecting along this journey, for much earlier than these words of the resurrected Jesus, Luke tells us of the words of John the Baptist in Luke chapter 3, “As for me, I baptize you with water, but One is coming who is mightier than I and I am not even fit to untie his sandals; he will baptize you with the Holy Spirit and fire.” Back in Luke chapter 3 the prophetic words of John the Baptist didnt’t make much sense…but now, as we are further along on this journey with Christ Luke is bringing his Gospel message full circle. What Luke began in his Gospel he is bringing to completion in his telling of this story in Acts chapter 2…this story we call Pentecost…the place that the journey of Jesus has now brought us to. But what is Pentecost? Why has the journey brought us here and where do we go from here? If we follow the life of Jesus this event marks its end. After today, we enter to a place that we call Ordinary time. It is a time where nothing special happens in the life of Christ: no hark the herald angels sings, no wisemen, no miracles, no resurrection, and no more Pentecost’s…what does this mean for us that our journey has ended here, today, in this way, with this story…yet this ending is also a new beginning of sorts. If we follow the text closely and if we pay attention to what Luke is doing in his Gospel and the Acts of the Apostles, 2 works that are separated in our bibles but were composed wholes by Luke originally, we find that despite the fact that we celebrate the big three events in the life of Jesus separately. Despite the fact that we celebrate Easter, then Ascension, then Pentecost…and we do so with a 50 day period in between them…despite all this Pentecost and the falling of the Holy Spirit on the disciples is not a singular event. These are not a series of events that are to be understood separately…rather they are all three events that function together in order proclaim one singular message and that is the Resurrection of Jesus. The Resurrection is the catalyst that gives birth to the Ascension and Events of Pentecost. It is a singular event marked by three distinct moments in the life of Jesus. What this means is that to try to understand Pentecost apart from Easter is misleading and to understand Easter without an empowering Spirit would be an empty proclamation. But this needs to be understood because often we separate these events to such a degree that days like Pentecost become removed from their Easter context and Pentecost becomes a time about my experience with God rather than my experience for God. In other words, Pentecost is not an event that happens so that the disciples can have a great personal spiritual experience. Are you listening? If we pay attention to Luke and his Gospel and his Book of Acts, the event of the Pentecostal empowering of the disciples is not about their own personal spirituality, conscience or assurance that they are right with God. It is, however, part of the journey that makes Easter proclamation possible. I know this is how this event is taught and preached…we are encouraged to have a Pentecostal experience, to speak in tongues, to be ecstatic and that this is what defines the indwelling presence of the Holy Spirit. Some of us may even remember with fondness that Nazarenes were often referred to as “noise-a-renes” since our tradition has been so influenced by Pentecostal fervor and forms of worship. This chapter is used by all manner of folks to describe the type of experience we ought to have with God…all the while this event only happens here and nowhere else…it doesn’t even happen exactly like this again in the Book of Acts or in Paul…or any other book that might be in the Bible. Traditionally, all of these events: Resurrection, Ascension, and Pentecost, were are all closely celebrated together because they are all movements of one unified narrative, one unified story that is not complete one without the other. By separating them on the calendar, which is understandable since we can’t celebrate everything the same day or the same week, we have unfortunately lost what Luke is doing with the this text and what Acts is doing by positioning this story in Chapter 2. Pentecost is not about giving us a new sort of experience with God and it’s not even about just empowering us in our own personal spiritual lives. Pentecost is about Easter because Pentecostal power happens in order for Easter proclamation to take place. Pentecost does not offer us a model of Christian experience that should be prayed for and replicated by others…if offers us the story of why the Spirit came, how it came and what it came for! Pentecost came to fulfill the words of Jesus, “It is written that Christ should suffer and rise again from the dead the third day and that repentance for forgiveness of sins should be proclaimed in his name to all the nations…YOU ARE MY WITNESSES.” We are witnesses of what?? We are resurrection witnesses! 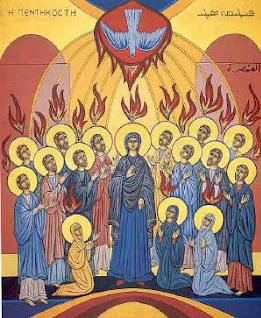 Pentecost happens and the spirit falls upon those that are still left under the shadow of the clouds of the Ascension so that those that saw these things, those that have been witnesses will be able to proclaim the resurrection! Pentecost is exists so that Resurrection proclamation can occur! In the Gospels, we do not see mass spreading of the stories of Jesus after his resurrection. The community of faith keeps this reality to itself. It sounds crazy, it can’t be, its impossible, the Jewish and Roman authorities are already suspect of those that used to follow this dead carpenter from Nazareth. The resurrection gospel of Jesus Christ that now he has been raised and so too will your dead body be raised from its dead state and the wages of sin that Kill us all have now been broken is not being shared after the resurrection of Jesus in the Gospels! Why? Because they do not have the power, the unction, or the witnessing ability to do so. They are stuck in fear, amazement, thankfulness, but lost about what to do now that the proof that Jesus is not dead has just ascended into the clouds. Now who’s going to believe them? Pentecost is the event that sets this faith in motion and empowers the disciples to take the Gospel to places it would have otherwise not reached. Pentecost is an extension of Easter in that it is the event that enables the Easter proclamation to go forth into creation. Its not about a new experience for me or you or the disciples, its about empowering our ability to proclaim what we have already experiencing by rushing into the tomb and finding it hollow and empty…the body of Jesus the Christ no longer there. That’s why tongues of fire fall on us…so that we can proclaim nonsense with boldness! If Pentecost is the power of God to proclaim the events of Easter to creation, then Pentecost is also marks the end of the world, the end times, the last days. I know this is not a popular conception of what the last days is all about but if Pentecost is about proclaiming the resurrection of Christ…then it is about proclaiming this resurrection because the ends times is upon us..and there is nothing more ends times and eerie than the resurrection of Jesus. That’s not normal and we need to quit making it normal. Jesus came proclaiming that the KOG was about to break upon creation. He came, along with John the Baptist, forgiving sins and telling people that his work was an extension of Gods signs that the end of the time and the renewal of creation were imminent. Then, in a shocking turn of events Jesus is crucified and killed…yet something apocalyptic happens…Jesus is raised! This was a common Jewish conception of the time that the last days would be marked by the resurrection of the dead and the church dared to proclaim that the last days had finally begun to occur in the very resurrection of Jesus, or what the Apostle Paul liked to proclaim as the “first fruits of the dead…” Jesus’ body being the first harvest of the pending collection of bodies that will be renewed…along with creation by God. SO by virtue of Pentecostal tongues of fire falling on the disciples so that they might be witnesses to the resurrection of Jesus, Pentecost must then be interpreted by us as something that occurred in the last days…and so long as we continue to have faith in Jesus Christ we must believe and proclaim that we are living as an extension of those last days that began with the events of Resurrection, Ascension and Pentecost. But our text goes further to argue that the message of Jesus is a message for the last days…the last days being those that exist from the Ascension of Jesus until his pending return…After the tongues of fire fall on the disciples and a scene that is reminiscent of a theophany in the Old Testament: A scene characterized by wind, noise and fire…the kinds of elements that God likes to use when his Spirit shows up on the scence…we see that Peter even changes the text of the Prophet Joel to interpret this event as an end times event. That’s right, Peter in his sermon doesn’t just quote Joel, he changes the text to interpret this event as the event that Joel was talking about…so let’s see interesting twist. In Pentecost Jesus is coming good on his promise to empower them with speech that will allow them to be his witnesses and that when this event occurs it will simply be an extension of the last days that was already begun when God decided to resurrect Jesus from the place from which no one has ever returned before or since. It is only the paranormal strange event of resurrection and the powerful falling of the Holy Spirit on silent disciples that can galvanize such bold and ridiculous proclamation to the world. It is only by this power that Peter could get up and proclaim as he does to the crowd in Acts 2 this powerful prophetic utterance of Joel…because the last time we heard Peter speak in Luke-Acts he was busy denying Jesus to a servant girl! Yes, I know Peter is the one that took the initiative to choose another disciple in Acts 1, but let’s not think for a minute that his urging of this is not to distract from his own failings of denying Jesus. Only in comparison to Judas does Peter look good, and it is only the power of the Pentecostal spirit that can empower such a man to even think of proclaiming something he so easily dismissed just a few chapters back. If Peter can experience Pentecost and tongues of fire that force him to speak that which he otherwise couldn’t then I have goodnews for all of us! Easter is not over…Easter is living! Christ is risen and on this day we celebrate when the Spirit came to give us the ability to witness to the Christ event that has initiated those things we call the last days…that the last days actually take place in what most of us call ordinary time, ordinary life, life as usual! So go and be witnesses!…leave this place with the same power of those tongues of fire…If Peter’s prophetic imagination can be reawakened…so can all of our denying of Jesus on this day be turned into a powerful witness of resurrection. At Easter Jesus was resurrected from his tomb. On Pentecost, we are , the Church is, resurrected from our/its tomb(s) with the power of Christ! After, I left the Assemblies of God I had to rethink a lot of what I believed. One of the things I have been avoiding is the book of Acts for this reason – I want to look at it with fresh eyes. You have definitely given me something to think about. Thanks and Blessings. Ed thanks for reading…and for wrestling with this very familiar text in an attempt to see past how we’ve always read something. Brother Nate – what an accurate and thorough proclamation of the Gospel through the lens of Pentecost. You’ve beautifully revealed the center and climax of salvation history as resurrection that ushers in the telos of creation. The big picture is so needed and you’ve given it to us. Thanks for your hard work and commitment brother. Keep proclaiming this so that cooperative grace finds us all proclaiming resurrection in word & deed by the power of the Spirit!